I was returning from a recent business trip and my flight got delayed an hour. Instead of going back to the lounge, I decided to sit by the gate and get some reading done. The sweetest gentleman sitting next to me started chatting up… First, he asked where I am headed, then, he recognized my accent and asked where I am from, and finally, what I do for a living? His conviction and a single choice of word – “LOVE” – stayed with me throughout my whole trip back. It is hard to admit that we often talk about the future of work, how business models are shifting, how the concept of leadership evolving and new organisational practices forming, yet, we rarely bring in what we – as employees – need to “be” or to “do” differently to create the work experiences we long for. What is ‘love’ anyway and what’s got to do in business? I think I want to start out by saying that majority of us are taught all the wrong things about ‘love’. Let’s take romantic love as a concept example. What do we know about it? Well, we know we are taught that everyone has a single soul mate in life and that our soul mate should be able to understand us without using words, which I presume majority of you would agree is a crazy assumption! I am yet to meet someone who can read my mind so profoundly… What else? We know the society refers to ‘marriage’ as a climax time of love (it is even called ‘hochzeit’ in German, literally ‘high time’), which again, I presume majority of you would agree feels like a joke because really, when we are agreeing to share our life experiences with someone, we are really only at the beginning of that relationship. We know we are screwed for staying non married, right? Further, it is a “horrific” experience to divorce because we become ‘single’ (another word I dislike very much and refuse to use) as if we have no other soul connections in life, etc.??!! Majority of us do not get an opportunity to learn about the true meaning of love; that love is about connection. No where in our education system or in our corporate training programs we are taught about the concept in depth or how to realize it in our life experiences. No one talks to us about the power love holds as a connective tissue. We have such limiting definitions of such an enormous word and very little skill to live it. We don’t know nor think about the fact that love happens between living souls but between living and non-living souls, too. Most importantly, we don’t know that love’s foundation is grounded in respect and patience. In the work context, love is about “the quality of attention we pay to things”. It is about what we choose to attend to — criticism or creation, fear or hope, our wounds or devotion to healing — and that choice determines the quality of our experiences. The magical thing about love is… Once we acknowledge the diversity of emotion it embodies, it becomes an active enabler of growth. It teaches us, for example, to accept that no one of us is perfect. It shows us that we can all become a spiritual teacher to one another and that we can become wiser and fuller through the experiences that may seem ‘difficult’ and that it is possible for us to remain ‘whole’ despite the situations given. Now, admittedly, many of the correlates of our work engagement are profoundly beyond our control. We can’t choose who we report to, we can’t always receive constructive feedback, we can’t always have the autonomy we desire or the right opportunities to deepen our skills, and we may not get to have socially supportive and/or equally contributing colleagues. That said, about 40% of the variance in work engagement lies within us. Yes, 40%!! We do have a choice to practice our love. Choose to create space for your ‘being’ today. Choose to practice your love. Give your full attention to the task at hand, get creative and seek pleasure in your effort. 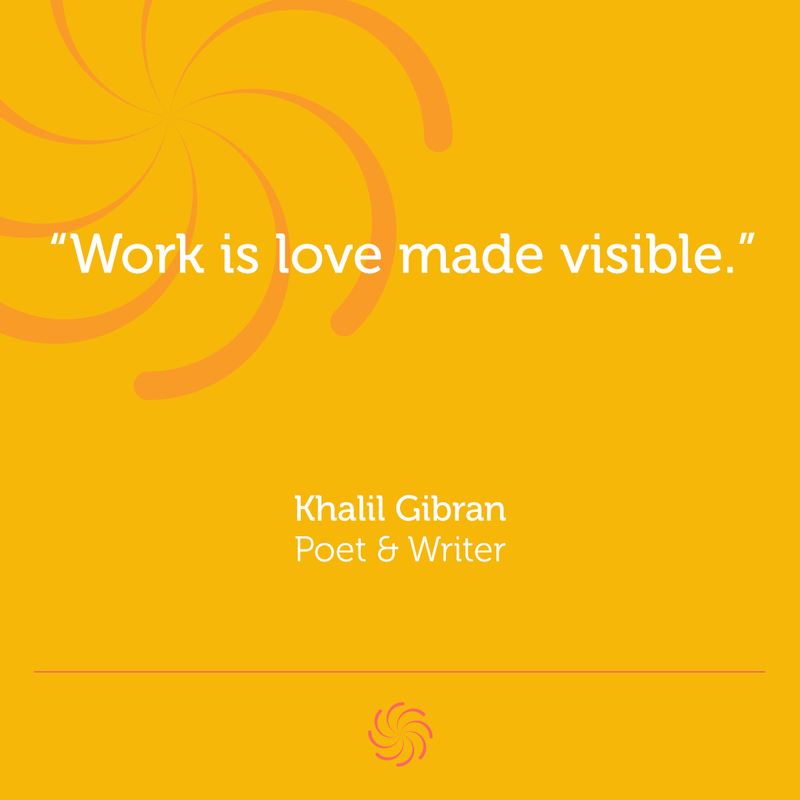 Despite the conventional wisdom, love has a place in the workplace. Let’s embrace and celebrate it! Is engagement biggest factor of happiness? Suppose u need to measure happiness in workplace which scale is the best? Seligmans Perma or what else?